For over 30 years Gerhard Herbst has been creating unique challenging pieces that consistently redefine the jewelry medium. Although a traditionally trained metalsmithing, Gerhard innovative jewelry often stretches the boundaries in both function and design. His affinity and intuitive understanding of the sculptural form is the feature which most apparent and influential in his work. 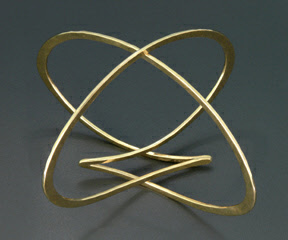 Born in 1959 Gerhard began making jewelry at age 15. He received his degree from San Diego State University and after graduating, with honors, Gerhard established his jewelry business in San Diego in 1984. Today Gerhard has become a leading jewelry designer and he exhibits and sells his pieces in the finest jewelry stores and craft galleries through out United States and in museums around the world.